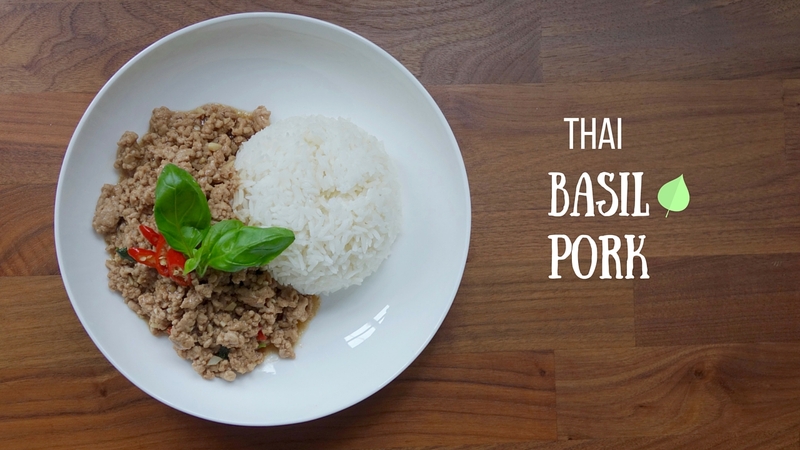 I've always adored Thai basil pork or Thai pork krapow when I've dined in Thai restaurants and never knew just how easy it was to make. In recent years, it's a dish that I often cook at home and love to serve at our dinner parties as I can double or treble the recipe to feed all my guests without too much effort. Each time I've made this dish or shared photos on social media, I get a lot of questions asking how it's made, everyone adores it! It only requires 4 condiments; light soya, dark soya, fish sauce and sugar. It’s so quick and easy to cook, not to mention how delicious it tastes served over rice. If you fancy going the traditional way, you can also top it off with a fried egg. Lucy, you are so cute! I haven't heard the video yet (sound is off on this computer!) but it looks great! Thanks for such a lovely video Hanh! Yes, would love to share more, glad you like them! One of our favourite dishes because its so quick and easy. We tend to add a fried egg on top...the yolk mixed with the meat is so good! Yes super easy and full of flavour! I sometimes add in the egg for G but non for me!